This FAQ page is a work in progress. At the moment, it’s primarily about book-related topics. It includes answers to the most important questions, but it’s far from finished. New questions are added all the time. If you need more information about the topics already covered, or you have questions that are unanswered here, please don’t hesitate to contact Marraii Design. Do you accept PDF instead of Word as a source file? Just like your printed book, pdf was meant to be the final file. It wasn’t intended to be modified once created. Over the years, third party software and Adobe itself made it possible to convert pdf to Word, but that doesn’t mean its conversion is any good. As a matter of fact, it’s horrible. Even the worst Word file I have ever seen is still miles better than a conversion of pdf-to-Word. Many people get confused by it. They convert their book from pdf to Word, open conversion in Word, and it appears to be a good looking file. Unfortunately, that’s merely a deception. If you click a button in Word to show hidden typographical marks, you will start to see the extent of deception. You will see that all your paragraphs are broken. What looks like a normal paragraph that you recognize from your book is actually not a paragraph at all. Every line of text in that single paragraph is broken at the end of the line with a paragraph mark!!! That means, every line of text in your book is now a paragraph in its own right. To be able to format your book at all, a formatter has to manually delete every single one of those new mid-sentence paragraph marks to reconnect your sentences into what used to be normal paragraphs. As each gets deleted, things shift in the file making it almost impossible to distinguish what should be paragraphs and what not. Needless to say, even in the smallest of books, there are thousands of lines = thousands of new paragraph marks = thousands of tedious deletions that take time and are exhausting to do. And all that before you even start to do the actual work you were hired to do—formatting. Over the years, there were some authors that argued how it wasn’t that big of a deal to do it. Really? Okay, if that’s the case, I let the author do it, and send the file back to me once it’s done. The result is always the same—they finally understand the horror of pdf-to-Word conversion that words just cannot describe. And broken paragraphs are just the beginning. They’re not even the biggest problem. Conversion issues with PDF files may include irregularly bolded text, irregular page breaks, inconsistent font sizes, inconsistent text flow, and missing or oversized images. Why should I choose a custom book cover design? You heard that saying how a picture tells a thousand words. Well, custom book covers tell the story about your book. They are made according to your creative brief, they convey your book’s main topic, and include author-suggested specificities that are crucial for the story. In other words, covers made by Marraii Design are custom-tailored to your book. Yes. You wouldn’t try to open a pdf file in MS Excel, would you? You would use Adobe Reader to view pdf. Likewise, epub and mobi have specific software, apps, and devices that open them. eReaders—devices with the sole purpose of reading epub/mobi like Kindle Paperwite, Nook Simple Touch, Kobo Touch, and many others. They don’t need installation of specific apps to open epub/mobi respectively. Apps—there are too many official and third party apps for reading ebooks to list them all. You can search for them and download the ones you want to your tablet, smartphone, or computer. Most bigger retailers offer download of their apps on their sites so that’s the first logical step. My ebook is enrolled in KDP Select. Can I sell my ebook anywhere else? No, you can’t sell your ebook version anywhere else (not even on your own site) as long as it is enrolled in Select (90 days minimum). However, your print version is not bound by such agreement, so you can sell it anywhere you want. Publishing through Amazon KDP is not the same as enrolling your book into Amazon KDP Select, so if you didn’t enroll your book in Select, you can still publish it everywhere else. Do you fix epub/mobi files that someone else made for me? No. Fixing other people’s code in epub/mobi is like looking for a needle in a haystack. That is not offered by Marraii Design. However, if you only have epub/mobi edition of your book, I can use that as a starting point for formatting and coding your book from scratch. Can I make updates/edits after you’ve formatted my book? Some files like epub, mobi, and pdf cannot be edited without proper software and/or knowledge of coding. Other files like MS Word can be edited, but it’s ill-advised to do so. Mere opening the file & re-saving it can alter carefully executed settings, and change the entire document, rendering it useless. MS Word does that without your knowledge. Sometimes, on screen everything looks the same, and then your book gets rejected on Smashwords, or prints awfully on Createspace. The reason is in the hidden side of the MS Word document. That’s why your manuscript should be edited & proofread before you send it to formatting. All edits after formatting in most cases mean you’ll need to have it reformatted all over again. Can I use the file you formatted for Smashwords and upload it on Amazon? No. Definitely not. There are some differences in how Amazon converts files and how Smash does it. For one, hyperlinked ToC in Smash file does not convert well on Amazon. It does convert well for on-page ToC, but it doesn’t get integrated into “Go To” menu that is essential for Kindle ebooks. Ebooks are absolutely different from print books, so do not expect them to look like an exact replica of a print book. With print, you control the layout. It’s a fixed format. The words, fonts and font sizes appear on the printed page exactly where you want them to appear. Your reader cannot change how it looks except damage the book. If a chapter begins on a certain page—it will always be there no matter what the reader does. With ebooks, there is no “page” per se! It’s an elastic format. Your ebook will look different on every e-reading device. Page numbers are irrelevant. What one person sees on their screen will not necessarily be on other person’s screen. The text of your ebook will shape, shift and reflow and look good on multiple screen sizes. Most e-reading devices and e-reading applications allow your reader to customize the fonts, font sizes and line spacing. Your customers will modify how your book looks on-screen to suit their personal reading preference and environment (even if that means they like to read 18 point Helvetica with blue fonts, lime background color, and triple spaced lines). So… unlike print edition, it’s important that your epub/mobi is coded and MS Word file is formatted to liberate the words in digital form. Why does my book look off in the online previewer? All online previewers are full of bugs! They rarely display books the way they actually will look like on people’s devices when purchased. Hyperlinked Table of Contents (ToC) doesn’t work in there, nor do any other links. It’s buggy, displays properly formatted text horribly, and your book’s appearance in there is nothing like it is in the actual ebook file. Smash says that it should not concern you too much because you don’t sell html versions of your book–what previewer file essentially is (this is a quote from their site, not my opinion!). Smashwords doesn’t seem to have any intention of fixing it, so you have no choice but to accept the hard fact–that in best case scenario, your book will be displayed in Arial for all custom paragraph styles and in Times New Roman for normal body style. There’s absolutely nothing you can do to make it look better. not properly formatted, break all Smash rules, won’t get accepted into Premium, will look all over the place as epub, won’t sell anywhere, but it will look decent in the previewer. Amazon’s site has an overriding stylesheet that governs how things appear in the Look Inside feature. No matter what you do in the source file that you upload to Amazon KDP, your book styling will get overridden by Amazon’s site stylesheet. However, the best preview results are gotten by uploading mobi instead of MS Word because mobi is written in HTML, thus looks better when stylesheet override happens. Moreover, the latest Amazon stylesheet even displays custom fonts embedded into mobi! That’s a huge thing compared to what previews used to look like over the years. When you publish via Amazon’s KDP, and check to see how your book looks like using their built-in online previewer tool, have in mind that it has numerous bugs that prevent the previewer from displaying your book correctly (especially with embedded fonts). Which links are forbidden on Smashwords? Affiliate Links: If you link to affiliate marketing pages, lead generation pages, and other similar stuff, Smash will close your account without warning due to violation of Terms of Service. Competitive Retailer Links: Don’t include links to different ebook retailers in your book. For example, Barnes & Noble will refuse to sell a book that encourages their reader to go to Apple or Amazon for more books. PDFs: Don’t link to PDFs, because not all e-reading devices may support the PDF format. You can gift them in giveaways run on your site, social media, other people’s sites and blogs, etc. Do I need to register my copyright before I publish? No, you don’t. Your book is copyrighted by you as soon as you’ve completed it. But. . . if your book ever gets stolen or pirated, and Amazon or other retailers request that you prove you are the real author, you’ll be in whole lot of trouble without it. It has happened to some people, so don’t dismiss it so easily. To register, go to the Electronic Copyright Office, and for $35 your book will have your claim. What software do you use to make mobi files for Amazon? Marraii Design hand-codes html files and converts them to mobi with Amazon’s KindleGen app. Do you make kindle books with Kindle Kid’s Book Creator? Which file formats do you accept for formatting? Acceptable file formats are: .doc, .docx, .odt, .html. Not acceptable: pdf, epub & mobi created by third parties. Which files do you create for books? For Createspace, IngramSpark, LightningSource—print-ready PDF. For Ingram’s ebooks, iBookstore, Kobo, and many others—epub. Who is Bookaholic on Fiverr.com? Bookaholic on Fiverr.com is Marraii Design’s profile for book formatting and small graphic design services related to book publishing. Hence the nickname—Bookaholic! Are you affiliated with Amazon, Createspace, Smashwords, Ingram, and others you mention on your site? No. Marraii Design is a single person with passion for formatting and design. Platforms for self-publishing like Amazon, Createspace, Smashwords, Ingram, and others are just tools of the trade. Their mentioning is unavoidable when we talk about publishing in the 21st century. No. Marraii Design offers design and formatting services only. Do you format children’s books, graphic novels, screenplays, or fixed format ebooks? No. Unfortunately, at this time children’s books, graphic novels, screenplays, and fixed formats are not supported. The preferred format for the marketing cover is an image of at least 2700 pixels on the longest side and at least 1688 pixels on the shortest side with 300 ppi to ensure image clarity on Kindle HDX devices. The image file size should be 5MB or smaller. – Infringe another publisher’s or artist’s copyright on the same cover. – Mention pricing or other temporary promotional offers. Do you offer fixed layout epubs? No. 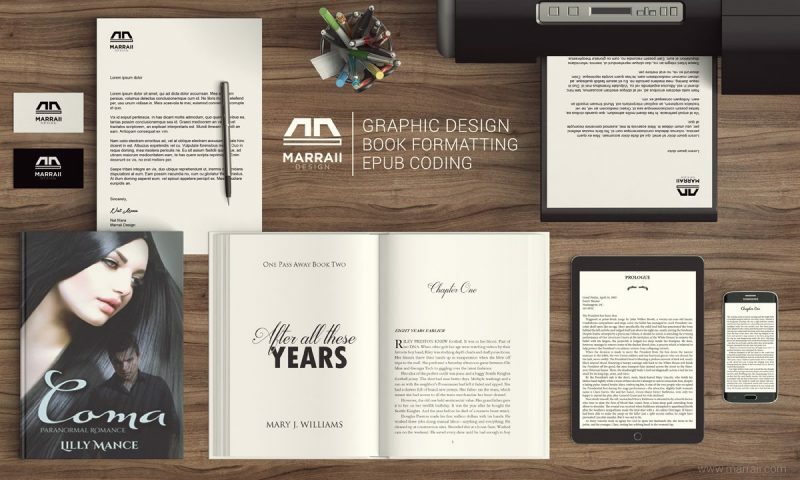 At this time, Marraii Design only offers reflowable epubs. Do you use automated conversion software to make ebooks? No. All Marraii Design epubs and mobis are hand-coded from start to finish (manually written code line-by-line that enables fine tuning). Other publishing platforms may allow many types of formatting, but Smashwords isn’t one of them! So, whether you’ve seen ebooks look like this or like that, remember—you surely haven’t seen them on Smashwords. Text wrapped around floating images — only in-line images allowed (above/below text)! Not to write “Printed in the United States,” because this is your Smashwords ebook, not your print edition. In most cases, your book will fail Smashwords’ manual review and get rejection from Premium. AUTOVETTER – is software that inspects your document upon submission for formatting errors according to the Smashwords Style Guide. PREMIUM CATALOG – is a collection of books that get distributed to major retailers because they meet Smashwords Style Guide requirements. MEATGRINDER – is software that creates reflowable ebooks that look great on any e-reading device. “Reflowable” means that the text of your ebook will easily flow across all screen sizes, whether your book is read on a small screen like a smartphone, or a larger screen like a tablet. Reflowable books enable your customer to click a button, and instantly enlarge the font size for more comfortable reading. I have tables that need to look good. Will they convert well on Amazon and Smashwords? On Smash, no. Smash doesn’t allow tables inside the file. They have to be converted into images or text in both Word and epub. Images, on the other hand, cannot be big so visibility might be an issue. However, epub is still a better choice because, even if tables are not allowed, as images that adapt to screen size they will still look okay. On Amazon, tables in Word look okay in most cases. When they are bigger, it’s better to have mobi hand-coded with tables set to adapt to screen size which cannot be done in Word. I have a lot of bullets and numbering. Will they convert well on Amazon and Smashwords? Nope. At least in 98% of the cases they won’t. Amazon and Smashwords’ conversion systems don’t handle them well. There’s nothing you can do in MS Word to fix that situation. Although it might look okay in some previews of your book, it won’t look okay on most devices, especially smaller ones like smartphones. When you find out—it’ll be too late. That’s why, if you have a lot of lists, it’s best to go with hand-coded epub/mobi that have lists handled perfectly. My book has a lot of images that are important. Is MS Word formatting the best option for Amazon and/or Smashwords submission? Not at all. The best option for books with images that need to be of better quality and visibility is hand-coded epub for Smash, and mobi for Amazon. Epub/mobi allow images to be set to adapt to screen size, while that option cannot be set through Word. Do you upload book/eBook files to online retailers on my behalf? No. Marraii Design doesn’t offer upload assistance. You can to do it yourself, or hire a virtual assistant to do it for you (there are folks out there offering VA services at affordable prices). Most people understand that, if you have a paperback and hardcover edition of your book, you need two separate ISBN numbers–one for each edition. But, when it comes to ebooks, lines get blurred. There’s no such thing as one ISBN number for all ebook formats. Just like printed formats, ebook formats come in several types, with two of the most important ones being epub and mobi (kindle). Thus, they both require their own ISBN. Some publishing platforms don’t require that the files you give them for conversion have ISBN. For instance, Amazon assigns their ASIN number to your ebook, and ISBN is optional. Smashwords offers free ISBN (if you don’t have your own) that you can assign to your ebook. So, if you don’t intend to sell elsewhere, you don’t have to buy your own ISBNs. However, the best practice would be to have one ISBN for each edition of your ebook (one for epub, one for mobi, one for pdf…). Special Smash notice on ISBN: It’s not necessary to place ISBN inside your ebook, but it is mandatory to attach it to your book via Smashwords’ ISBN Manager feature on your Smashwords dashboard. If you don’t have an ISBN, Smashwords offers one for free. That free ISBN is for epub edition of your book that Smashwords will send to their network of retailers, and it is not for other formats of your ebook that they will generate (such as pdf, mobi, and so on). What is Smashwords Style Guide? MEATGRINDER – is software that creates reflowable ebooks that look great on any e-reading device. “Reflowable” means that the text of your ebook will easily flow across all screen sizes, whether your book is read on a small screen like an iPhone or a larger screen like an iPad. Reflowable books enable your customer to click a button and instantly enlarge the font size for more comfortable reading. What is Smashwords Premium Catalog? You guarantee my book will pass, but are there exceptions? I guarantee your book will pass the AutoVetter on the first run and thus will get into the Premium Catalog, but…if your book is a public domain work, incomplete or partial book, appears elsewhere on the Internet under other authors’ name, your erotica characters are under age, or you write about get­-rich-quick “systems”––there’s nothing I can do to make your book enter the Premium Catalog! If my ebook cannot look exactly like my print edition, why bother? By giving up control over the fixed layout that you have in a printed book, you gain a lot more with reflowability of an ebook. Instead of making your book accessible to only those that read printed books, you’re making your book accessible to millions of potential readers all over the world that prefer digital. What file formats will I get for my cover? Your ebook cover will be delivered as high resolution JPG and PNG. Your print book cover will be delivered as a print-ready PDF. I want to use stock images inside my book—do you cover the cost? No. You will need to buy them. Can I send you my own images to use inside my book? Yes, but make sure you own the rights to use them, that they are big enough, and high enough in resolution (min 200dpi for print). Selecting appropriate fonts in different sizes and styles for chapter openings, headings, subheadings, etc. Properly fitting your text and illustrations to agreed-upon page trim size. Placing text and illustrations in an effective and appealing way. Achieving consistency and uniformity of the entire book while keeping it elegant, clear, and above all readable. Delivering finished book format in a print-ready PDF file. Above-mentioned applies only to printed book layout because ebook formatting is a lot more restrictive. When we talk about print, we talk about designing layout and typesetting. It’s a lot slower process of creating a visually appealing art. However, when we talk about ebooks, we talk about formatting and coding where different rules apply. Flexibility and functionality take precedence over beauty. How long does it take for my book to be formatted? Each manuscript is different, so the time-frame depends on your book’s word-count, its overall complexity, whether you’re having your book typeset for print, formatted in MS Word for Smashwords/Amazon, coded as epub/mobi, or any combination of the aforementioned. Thus, it can take as little as few days or as long as few weeks. Will I get source files for my cover? Marraii Design can provide a layered PSD upon request. Will you send me fonts that you used? No. By purchasing fonts (free or full priced), Marraii Design signs “End User License Agreement” (EULA) that forbids distribution of font files to third parties. However, you will be provided with font names and links to where they can be bought/downloaded on the Internet. This way, you can personally buy a commercial font or download a free font. Where do you find fonts? Marraii Design uses commercial fonts that were personally purchased or free fonts that were downloaded from trusted font sites. Do you create fonts for covers? No. Font design requires special skills and software that Marraii Design does not possess. Is there a limit to the number of stock images you use? Yes. The cost of stock images used in a cover design cannot exceed the price paid for the cover itself. What kind of images you don’t use? Marraii Design never uses images from Google search, images found on other people’s blogs/sites, desktop wallpapers, or clipart from random websites. Will you send me those images along with the final cover design? No. You are buying the final product—your brand new cover design that is a result of Marraii Design’s creative work. You’re not buying individual images purchased on stock sites for the purpose of creating your cover. However, you will be given links to those images on their respective stock sites, so you will be able to buy them if you need them separately. Have in mind that those source images, in their original form, might look quite differently than they do on your cover because they will have undergone a big makeover. Is the cost of stock images included in the cover design price? Yes. All photo expenses are included in the price. Where do you get images for your cover designs? free stock images and public domain images from verified websites like PixaBay.com or Wikimedia Commons. Can I send you my own photos? Yes, but make sure you own the rights to use them, that they are big enough, and high enough in resolution (300dpi for print). There are two epub formats: epub2 and epub3. Marraii Design offers only epub2 creation until epub3 becomes widely acceptable (which it’s still not). ePub2 is the most common format for sale on the market and all of the retailers accept them (Amazon accepts epub2 as a source file for conversion, but not as a stand-alone selling format).